At Dawn, we believe that transparency is key to success. As the Co-Founders, we decided early on to make a statement of intent for how our company would be defined and the people we would work with to build this vision. One of the first things we did, was work with psychologists together, unearthing our own positives and negatives, laying them bear to one another, in an attempt to better understand the gaps, our own flaws, but most importantly - identifying where our own potential to grow lies. We’ve worked together for a long time, but we knew it was essential to discuss where we can help one another work on these developmental areas, or ‘blind spots’. Better yet - we’ve printed out and placed our own psychometric profiles on the wall. This means any intern, investor or employee coming to the Dawn office in Soho, will be able to see us at our very worst, (or best - depending on where they choose to look). 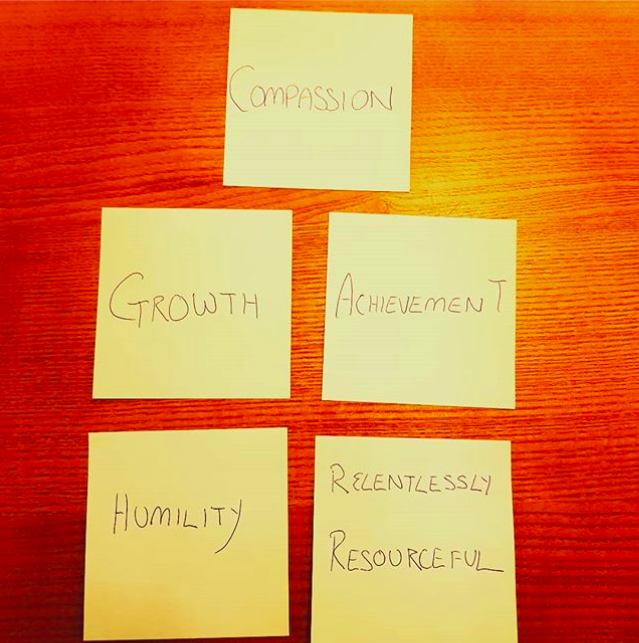 By spending the time analysing our own values individually, and making compromises, as you always must when reaching towards a common goal, we ended up with a set of values we were happy with, at first. We were pretty happy with this outcome, as we feel like these are all values we respect ourselves for having, and most importantly - one another. Anyone we work with who embodied these, would be the perfect cultural fit. On reflection however, we decided we needed to turn these into something more exciting. This is where we’ve ended up. #BrainFirst (this is a statement about how we approach our whole company). Keep a sense of humour and humility. “Keep a sense of humour and humility” is the ability to laugh at oneself (and with others). After all, building a company should be the most fun you’ve ever had. Equally, it’s incredibly common (and we’ve worked with many people like this) to have an enormous ego which can totally get in the way of good judgement calls - and people who are often too serious, can make this mistake. “Hustle don’t hassle” is simple. We aren’t expecting you to be Gary Vee, far from it. We actually just expect you, like we expect ourselves, to have the initiative and curiosity to figure things out for yourself. “Have you checked Google” is probably a lazier way of putting this value together. But frankly, when you are building a company with a huge vision, as the Founders it’s far too easy to get bogged down in answering silly questions that people can find answers to just as easily as you can. You should be independent, hungry to learn, and desperate to apply that knowledge at a rapid rate - like we are. “Pursue Potential with Purpose” - we want to employ special people who have great potential, and are willing to work tirelessly on unlocking that with a purpose, and around a common goal - in this instance; building Dawn to help people achieve theirs. In return what we will offer is world class training, flexible working conditions that reflect modern life, and a common sense of achievement as we dream big, and reach our potential as a team. We send our weekly newsletter of Brain Food every Sunday, are recording a Podcast, in the lab working with dieticians, nutritionists and biochemists to create a variety of organic nutritional products that will help you optimise your brain health and achieve more. Most importantly, we are building a community for people who want to achieve their potential together. We need the most ambitious, smartest, humblest, funny and caring people to join our mission. Older PostWhat Does 'A New Dawn' Really Mean?